Lady Honora Parker must get engaged as soon as possible, and only a particular type of man will do. Nora seeks a mate so abhorrent, so completely unacceptable, that her father will reject the match - leaving her free to marry the artist she desires. Who then is the most appalling man in Manhattan? The wealthy, devilishly handsome financier Julius Hatcher, of course! MIXED FEELINGS ABOUT THE HERIONE!! A gifted fortune-teller from a humble background, Jenny can make even the most sophisticated skeptic believe her predictions simply by batting her smoky eyelashes. That's until she meets her match in Gareth Carhart, the Marquess of Blakely, a sworn bachelor and scientist. Broodingly handsome, Gareth is scandalized to discover his cousin has fallen under the spell of "Madame Esmerelda", and vows to prove Jenny a fraud. But his unexpected attraction to the fiery enchantress defies logic. Jenny disrupts every facet of Gareth's calculated plan - until he can't decide whether to seduce her or ruin her. Now, as they engage in a passionate battle of wills, two lonely souls must choose between everything they know...and the boundless possibilities of love. 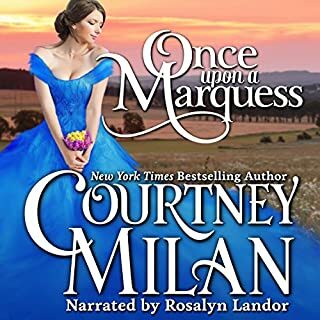 ©2010 Courtney Milan (P)2010 Audible, Inc.
A very well written and passionate historical romance. Garreth is a proud, lonely marquis who only believes in science and numbers, and sets out to prove his cousin's psychic is a fraud. Madame Esmeralda, a.k.a. Jenny, makes her living as a fortune teller. She has learned some hard lessons because of the circumstances of her birth. But she is still hopeful and resilient. She's also very perceptive and kind of heart. When Garreth and Jenny meet, they start a teasing, cat and mouse game that eventually leads them to a passionate romance. These two made a great pair, the subtle wit and humor, and their fiery arguments definitely made this story interesting. By the end, both characters have grown. Even the secondary storylines of Garreth's sister, Laura, and Garreth's cousin, Ned, are very well done. I highly recommend this book and will definitely read more by this author. What made the experience of listening to Proof by Seduction the most enjoyable? Great story and great narration. Full of exchanges between characters with much emotional impact (not just romantic, but also of friendship, compassion, etc). The allusion to one of the main secondary character's depression was also moving - and unusual for an historical romance. The narrator struck the right note throughout the production. Well worth a credit, as well as the time spent listening to it. Recommend it highly, and now look forward to reading the "sequel", Trial by Desire. 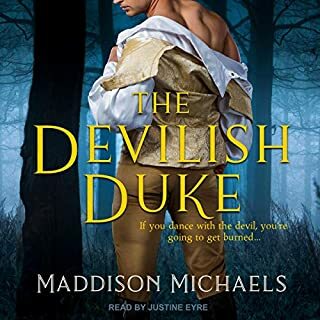 I re-read (re-listened to) this book recently and found that it had all the things I love as well as all the things I kind of hate about Courtney Milan books. First, the hate: it dragged. The ratio of action--which I would define as anything at all happening, if only a conversation--to interior monologue and exposition of the characters' thoughts and motivations was just too low. The story ground to a halt all too often. And this from me, a person who loves Mary Balogh's books, a writer who spends a lot of her time describing the same events from everyone's perspective and then rehashing reactions and motivations, so I actually have a very high tolerance for slow paced, cerebral romances. 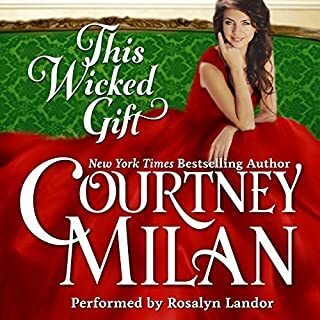 I have also come to the conclusion that the novella is Courtney Milan's best format. She writes such beautifully crafted shorter works that it always feels to me that her novels are bloated by comparison. That is definitely the case in this, her first novel. My other major problem was how isolated Jenny was. For all we're told of what a warm person she is, we don't see any evidence that she had any friends in London. The Madam Esmeralda persona might have made it difficult to allow anyone too close, but it's hard to believe there was no one besides Ned she'd really consider a friend, particularly since she schools Gareth in the art of friendship. As for the good, well, she writes beautifully and does an almost too-good job of conveying lower class poverty and desperation. She also does a particularly nice job of depicting a socially awkward hero, not someone whom we diagnose in hindsight with our 21st century knowledge (as opposed to Ned, who is clearly bipolar), but someone who is simply ill at ease with small talk and never has known how to relate to people. I also loved how she shows that as a fortune teller, far from being a fraud, Jenny actually provides a valuable service to her customers in acting almost as a therapist, decades before such an idea would even emerge. I'm glad I revisited this one. Courtney Milan delves more into complexities of characters than most romance novels. Ending is predictable, but the journey to the end is an enjoyable blend of sophisticated dialogue, introspection, and sensual interaction. This is why I have an audible account! Excellent character development! The narration added so much to the story - elegant, yet passionate, varied character voices, excelllent job! Ned's story continues with a novel I have already heard ...I'm not sure of the title and i don't think Audible listed the books as a series. Why? I would have preferred to hear the stories in order. Anyway...a great use of my credit. Loved it! What other book might you compare Proof by Seduction to and why? Not sure of the title. See review above. What about Priscilla Carson?? ?s performance did you like? Nuances between characters' voices. Articulate yet emotional at the right times. Excellent! YES!...but I don't have that kind of time! More by this author and narrator, PLEASE!! OMG!! Super funny and such a clever story. I absolutely LOVED this book. I am soooo glad I purchased it. I never really laugh out loud when reading a book and the story has so many funny moments that I could not help myself. When I read the reviews and saw 4.1 I bought this book with hesitation but boy am I glad I did. This is one of the wittiest books I have read in a LONG time. The narrator does a good job, perhaps not a 5 but a definite 4.2, but I gave her a five because I did not want her performance to affect this book’s quality. Do not miss a chance to be delighted! That was my first book for Courtney Milan. She is. Talented writer ! Artistic in her writing . I liked it ! Sensual and funny . Loved the story and characters. The narrator was good but not as splendid as others like Rosalyn Landor . She needs to work more on animation to add life to the characters . Twenty-one yr. old Ned sounds like a 12 yr. old boy. Otherwise, appealing voices. Jenny's character is amazing. The story itself was enjoyable but I was disappointed by the narrator. While she did make an attempt to differentiate between the speakers, giving Ned the high-pitched voice of a 9 or 10 year old boy to a young man made me cringe every time I heard it. When I first read the story line I was unimpressed that the heroine was a “Fortune Teller” however, what a great surprise at how wonderfully written and enlightening this was about the plight of women, in this era, with no hope for employment or independence. A super love story and evolvement of a “Nobleman” to a “Man”. I highly recommend this book. Courtney Milan is a very talented writer and I thoroughly enjoy her books!